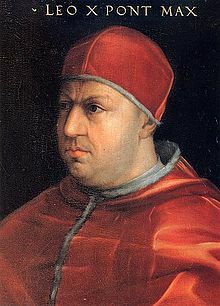 Pope Leo X (Latin: Leo Decimus; 11 December 1475 – 1 December 1521), born Giovanni di Lorenzo de' Medici, was an Italian priest of the Roman Catholic Church and the 218th Pope from 1513 to his death in 1521. Giovanni de Medici was born in Florence. He was the second son of Lorenzo the Magnificent. He studied theology and canon law at Pisa from 1489 to 1491. Six days after his election as pope in 1513, Medici was ordained as a priest. Two days after his ordination and eight days after his election as pope in 1513, Medici was made a bishop. At the age of 13, Pope Innocent VIII named Medici cardinal in 1489. Cardinal Medici was elected pope on 9 March 1513. On the 15 March he was ordained priest, and he was consecrated as bishop on March 17. He was crowned Pope on 19 March at the age of 37. Pope Leo was involved in Italian and European political disputes. Leo was a patron of Michelangelo and Raphael. ↑ 2.0 2.1 2.2 2.3 2.4 2.5 "Pope Leo XI", Catholic Encyclopedia; retrieved 2011-11-8. ↑ 3.0 3.1 Society for the Diffusion of Useful Knowledge. (1839). "Leo X", Penny cyclopaedia, Vol. 13, pp. 426-428. "Pope Leo X". Catholic Encyclopedia. New York: Robert Appleton Company. 1913. This page was last changed on 26 November 2017, at 10:41.